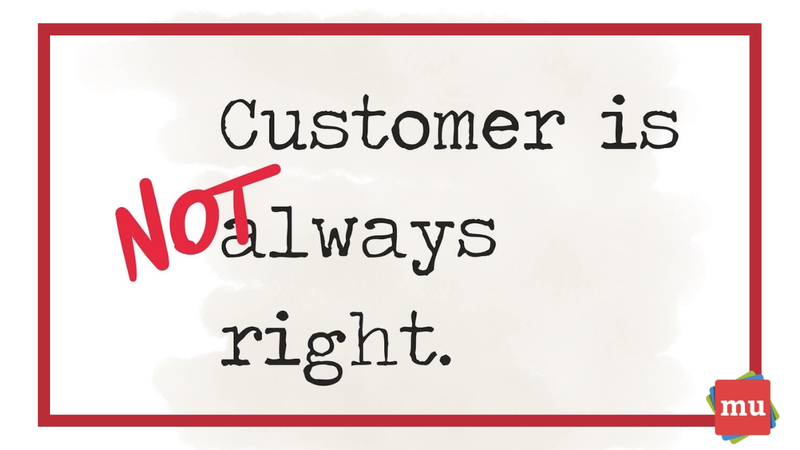 Regardless of the industry you work in, it’s pretty safe to assume that you’ve been told that the customer is always right. And while the saying may be well-known, it’s plain old wrong. media update’s Aisling McCarthy explains exactly why that is — and what PR pros can do about it. 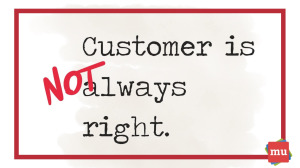 “The customer is always right,” — a saying we’ve all heard hundreds of times before. The only problem is that the customer is not always right. Finding clients is a challenge all on its own, so when you’ve got one, you want to go above and beyond the call of duty to keep them happy. While this type of thinking may be admirable from a customer-service point of view, when it comes to public relations, you have to get over your fear of saying ‘no’ to clients. The truth is that, public PR is not a product being sold, it’s a service. And your clients have hired you — and your agency — to produce results. They wanted to reach a goal and felt that you were the right fit to make that happen. So in order to actually give them what they have asked for sometimes means telling them that they are wrong. Saying ‘no’ is not bad customer service. Remember that you are the expert and that it is your job to advise your client as best you can. Sure, there will be times where they will disagree with you and insist you do things their way, but to simply give in and give them what they want means you are not doing your job. For example, imagine that you’ve just been hired by a new, youth-focussed brand that wants to increase brand awareness and generate 5% more website leads. But, they also want to spend 90% of their budget on television ads. What do you do? Thanks to your time in the industry, you know that more and more of the youth are using streaming services, so television ads might not be the best place for the client to spend most of their money. You think they’d be better off allocating that money to content marketing and activations — so tell them. You have to act as an advisor to your client, even if that means saying ‘no’. And while it’s never easy to say ‘no’ to a client, it’s your job to advise them what will produce the best results (and what won’t). At the end of the day, your client will thank you. Remember that saying ‘no’ is not bad customer service. So, what can PR pros do? You have to strike a balance between pushing back and maintaining your relationship with the client. In the most professional way, you have to let the client know that you are the expert. Shooting down someone’s ideas can be tricky, especially when that someone is a client. It is vital that you approach the conversation in a wholly professional manner and come from a place of respect to avoid any hurt feelings. 1. Have the conversation with your client in person. Email- or text-based conversations can easily be taken out of content. 2. Review the goals your client wants to achieve and explain why their idea won’t meet them. 3. Back up your reasoning with facts and figures. The more prepared you are, the better. 4. Offer a new solution that will help them to reach their goals. Be sure to clearly explain why this approach will work. 5. Be sure to listen to the client’s reasoning. Listening to them can help you better understand their point of view. 6. If your client still wants to go ahead with their idea, offer some kind of compromise that will help them achieve their goals. 7. Ensure that you keep communicating with to let them know how everything is progressing once you have implemented the agreed-upon strategies. As long as you make sure that the client feels heard, and that your suggestions are backed up by solid reasoning, everything should go smoothly. Remember that you and the client are on the same team and you want to achieve the same goals. So you have to work together! Saying ‘no’ is inevitable, but it doesn’t have to be difficult. As long as you make sure your client knows that you are on their side, and that you do know best, you will gain their trust — and their respect. While simply being a yes-man might make your client happy in the short term, when things go awry, they’ll be upset that you didn’t do more to advise them. You have been hired for a purpose — to help your client meet their goals. So it’s vital that you do everything you can to guide them in the right direction. What do you do when you think your client isn’t on the right track? Let us know in the comments section below. Hey — you! Pssssssst. Want to know the secret to getting ahead in the public relations industry? Of course you do. Check out our CHEAT SHEET: Five tips for PR best practice.